Currently the seventh best female chess player in the world, Kateryna Lagno has broken records on her way to the top of competitive women’s chess. She broke Judit Polgar’s record of youngest to become a Woman Grandmaster and has also won many tournaments. Now that she moved from Ukraine and lives in Russia, she has more opportunities for chess competition and will definitely be improving her play even more in the near future. Kateryna Lagno was born in the Ukraine and ran through the women’s FIDE titles at a young age, becoming a Woman FIDE Master in 2000 and a Woman International Master in 2001. She held the record for youngest Woman Grandmaster ever when she became one at an extremely young age. She did this at the age of 12 years, 4 months and 2 days, breaking Judit Polgar’s record that had previously stood. She won the 2005 European Individual Women’s Championship when she was only 15 years old. She also won this same tournament in 2008. She became an official Grandmaster in 2007. 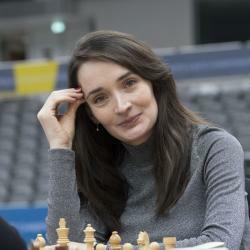 Ever since 2008 she has been a leader for Ukraine in the Chess Olympiad. Recently she moved to Russia and has continued to be a strong chess player, ranked right now as the 7th best female chess player in the world.